Maintenance Removal of top for winter months No maintenance requirements. No maintenance requirements. Strength & durability factors Durable Bolted Frame, handles normal winds easily when properly secured. 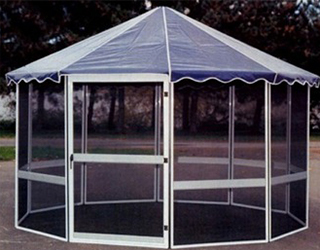 Durable Bolted Frame, handles winds and snow loads when properly secured. 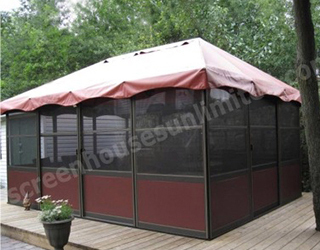 Heavy Duty Frame & Roof Very durable, handles winds & snow loads easily. Construction 44” wide x 74” high Aluminum Screen Frames, joined with Vinyl Hinge, Fiberglass Screens. Interior wind & privacy panels available. Easy roof tensioning system. Excellent roof overhang for appearance & water drainage away from screens. 44” wide x 79” high Aluminum Screen Frames, joined with Vinyl Hinge, Fiberglass Screens. Interior wind & privacy panels available. Easy roof tensioning system. Excellent Roof overhang for appearance & water drainage away from screens. 1/8” Thick Extruded Aluminum Load Bearing Framing. 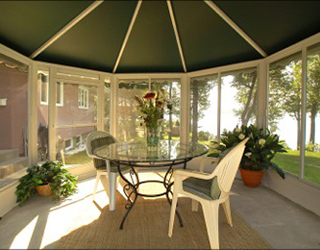 Fiberglass screens, Kick plate, Sliding Polymer interior windows included. Patented roof tensioning system. Excellent Roof Overhang and water drainage.